First two column values are Product Category Code and Description respectively. Third column represents the Category-wise Product Sequence Numbers and the last column value is Product Description. Product serial is consecutive numbers. Both Category Code combined with the Product Sequence number forms the PrimaryKey of the Table. 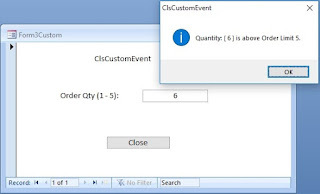 Duplicates in Product Sequence number is not valid. The Product file contains several products under each category (1. Beverages, 2. Condiments etc.) and the products under each group should have their own sequence numbers. The Product sequence should not end up with duplicate values. 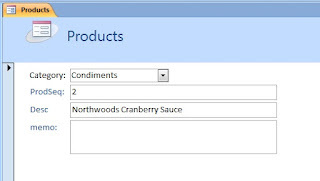 When a new product is added to the file under a particular Category, the Form should generate the next product sequence number automatically. It is impossible to keep track of the last sequence number used under each product group manually, during data entry. But we can give that job to MS-Access to do it effectively without mistakes. A simple VBA routine on the Form can do it for us. The first field is Category Code (1,2,3 etc.) is a lookup field (Combo box) linked to the Category Table. The first Column Width is set to 0 on the Property Sheet so that the description of the Category is displayed in the Combobox rather than the numeric value. During data entry the User selects a Product Category on the first field in preparation for entering a new Product under that Category. The next sequence number (the existing Product sequence number + 1) inserted automatically in the second field ProdSeq, when the User presses Tab Key to leave out the Category field. The User needs to enter only the Product Description manually. The ProdSeq field may be kept locked so that it is protected from inadvertent changes. The program works only when the User attempts to create a New Record.